Villa Sadymar was founded at the beginning of 2016. Our family decided to start a private business of rental because we really love to meet people from all over the world, and show the Cuban culture and traditions. We are a typical Cuban family, my husband and my two kids enjoy life spend a good time here together in harmony. My property has one wide room, the room is private with private bathroom, with kitchen and dinning room. The place has TV, air conditioning, one double bed and additionally we can add a single bed. In the price is include clean service, towels, toilet paper, etc. 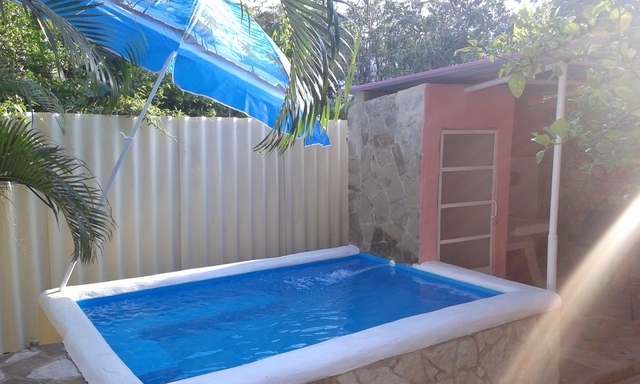 The place has an small swimming pool, a big garden, private parking and a place for laundry. There is no common areas, all the areas related to the room are dedicated to the guest. Our service are as follow: breakfast, lunch and dinner, airport transportation, taxi service, laundry, tourist guide. My property is located in a village named Cojimar, just to five minute to the Downtown Old Havana by car. Cojimar is nice place, quite, plenty of tradition. Here, the famous American writer Ernest Hemingway wrote the novel The Old Man and the Sea. Cojimar has many restaurant, and shop galleries, good bar, a disco, and a wi fi zone. We believe the customer should book our house because our family. We want they feel here as part of our family sharing our life, chatting in our garden, drinking a good Cuban coffee, in peace and harmony. Smoking policy: Smoking allowed in all rooms and the common areas.